I know how hard it can be to try and get in your daily recommended serving of vegetables, but fear not, my Fully Loaded Spicy Mexican Loaded Baked Potato is here to save the day! 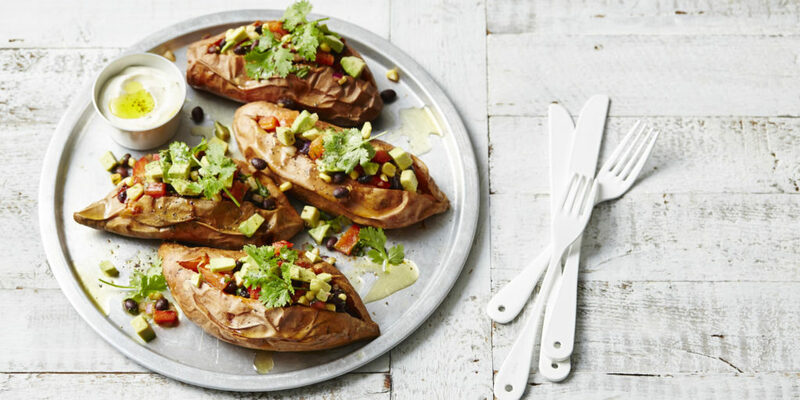 With a crispy skin and perfectly soft inside, this sweet potato dish is stuffed full of flavour! The combination of Spicy Mexican Beans and fresh veggies such as red onion and capsicum makes for a delicious combination. Served with avocado, coriander and sour cream, what's not to love here!? 5 ml extra virgin olive oil. 15 ml extra virgin olive oil. 2 cans black beans, rinsed and drained. 2 cobs corn, kernels sliced off. 1 cup coriander, fresh, leaves picked. 1. Preheat a fan-forced oven to 200°C/400°F/Gas Mark 6. 2. Rub potatoes with olive oil and sprinkle with salt and pepper. Prick them with a fork a few times and place them into a large baking dish. Place into the oven and cook for 50 minutes until skin is crispy. 3. While the potatoes are baking. Add olive oil and onion to a large frypan over medium heat. Cook for 5 minutes until onion softens. Add in beans, corn, capsicum, garlic, chilli powder, cumin and coriander and cook for 1 minute until everything is warmed through and coated. 4. Remove potatoes from the oven and slice each one open. Pry the potato open a little and stuff the Mexican Beans between the four potatoes. 5. Serve potatoes between four plates. Top with avocado cubes, sour cream and coriander. If you’re dairy free or vegan, please free to substitute the sour cream for your favourite dairy free alternative. If you like, feel free to leave out completely, you may find that the avocado and coriander are more than enough for you – the choice is yours! Let me be the personal trainer in your pocket! G’day, Sam Wood here! Join me every day for a different 28 minute workout. My dynamic workouts are suitable for all fitness levels and designed to get results fast. Join me in the kitchen with a delicious eating plan every week created by our 28 nutrition team with recipes and shopping list at the touch of a button. Did you know we’re also the only online program with the I Quit Sugar Recommended Tick? Let me show you how to get your mind right, with my mindfulness & motivation experts who will ensure that you de-stress, sleep better, focus and stay motivated. As a member of the 28 family you are never alone. You will be supported every step of the way by me, my crew and thousands of 28ers just like you.